We're not very good at taking rest days. I in particular want to be on my bike each day, moving on. On an earlier trip, we came up with the idea of “rolling rest days.” They were low mileage days – really low, like 20 or less – when we took it easy and just sauntered on to a new location. We had our first such modified rest day last week. But it wasn't the short ride that made it relaxing, it was our destination. We were guests of Warm Showers hosts Rodney and Debbie, who have a lovely home on Lake Jackson. Not only that, they have a separate guest house that they turned over to us for the night. 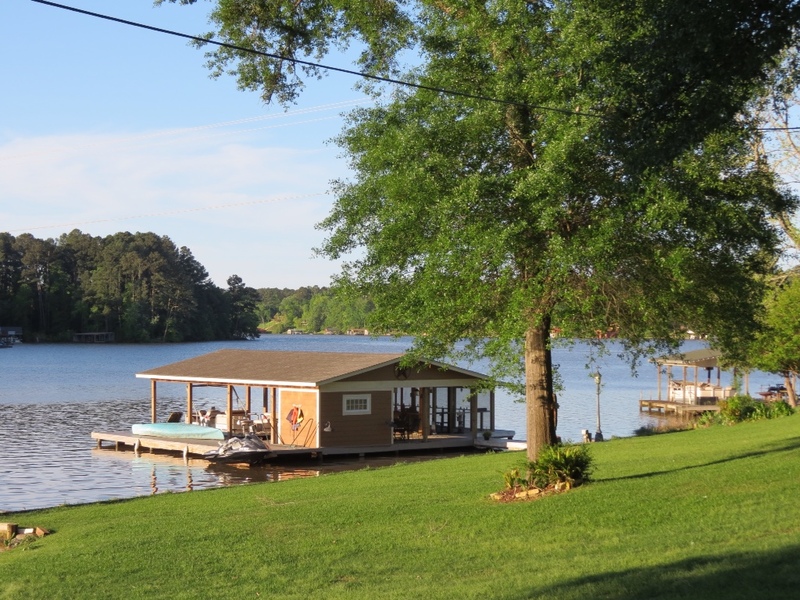 It happened to be a beautiful afternoon, and we enjoyed visiting with our hosts while sitting out back overlooking the lake. We had the advantage of both good company and being able to retire to our own space at the end of the evening. The golden sunshine bathed the lake in a beautiful glow which we admired as Rod fed us plentiful pancakes before departing in the morning. Our next Warm Showers stay started normally enough. We'd just made our way into Oklahoma and had plans to stay with Stan and Misti for one night in Broken Bow. 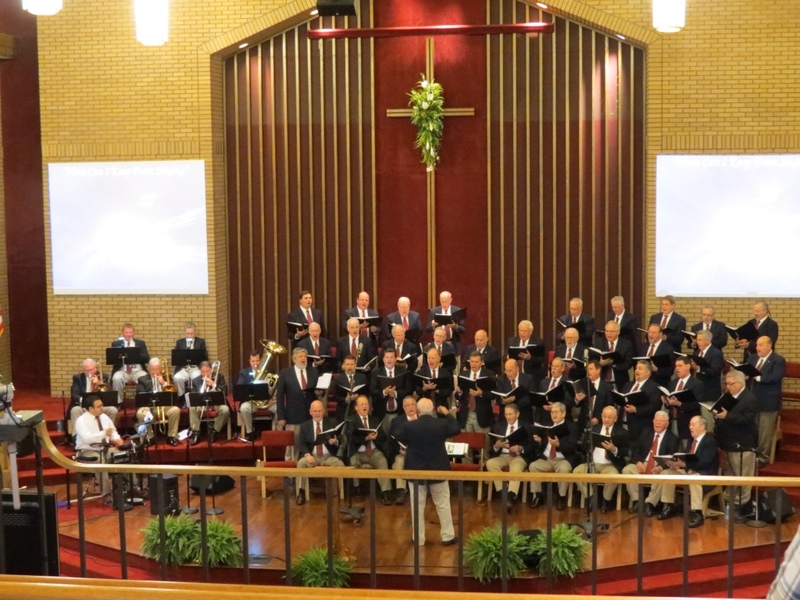 Our timing was very fortunate, in that their church was hosting The Singing Men of East Texas that evening, and we were able to attend the concert with them. Those men had powerful voices and sang with great fervor. When accompanied by their own brass ensemble, they rocked the church! It was a dynamic evening of music. Our plans to cycle the next morning were quickly scrubbed when we awoke to thunderstorms and pouring rain. 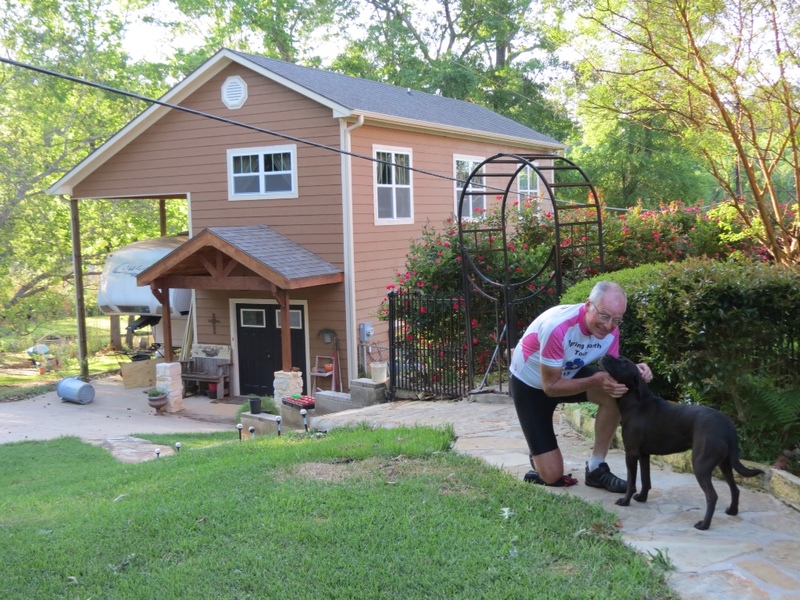 I kept thinking we'd find a window for cycling, but Stan and Misti knew better and immediately extended an invitation to stay another night. We felt so fortunate, as all day long the storms regenerated and kept up a constant downpour. So rather than slogging through it all, we had a lovely rest day in the comfort of their home, warm and dry. An added benefit to our extended stay was the opportunity to see the new bike shop that Stan and Misti are opening. Having acquired an historic old stone building in Broken Bow built by the WPA, they have been hard at work using their own skills and sweat equity to restore it. After months of work, progress on the transformation is astonishing and we could easily envision its possibilities. Their plans are exciting and we can't wait to hear the news of opening their Gear Down bike and trailer shop. Sharing a delicious dinner prepared by Stan with good company and a cycling movie was the perfect conclusion to our unexpected day of rest. Despite storms continuing into the night, the morning dawned sunny and clear and we were perfectly refreshed and ready to cycle. Thanks to Warm Showers. This entry was posted in Keeping Fit, Travel and tagged Cycling, Cycling Trip, Spring North Cycling Tour, Travel by Molly. Bookmark the permalink.